My spiritual life began in Vrndavana some 30 years ago at the lotus feet of Sri Sri Krsna Balarama, Sri Radha Syamasundara, and Sri Sri Gaura Nitai. I arrived on foot from Mathura and reached in the evening time and as I walked on the road approaching Vrndavana there were no people walking on that road but only many cows. It was as if I was coming home with Krsna and His cows. Then I entered Vrndavana through the Prabhupada Gate and that was more then symbolic, only by Prabhupad’s mercy can we enter in to Vrndavana. This is where I grew up in spiritual life chanting japa in Srila Prabhupada’s house. When I first came Prabhupada’s Samadhi was a small shed, it was very intimate and later the current, majestic building was constructed around it. We, the new devotees would twice a day clean the temple with brooms and fresh water. Gradually I got more responsibility and I became responsible for different affairs in the temple including the ringing of the temple bell. The bell had to be rung by the security on the hour and half hour and Prabhupada had said, that he would judge the management by the ringing of the bell. Management in Vrndavana was and is not a simple thing, I try to help, sorry if not everyone is satisfied. This year I had the good fortune to be in Vrndavana for Chandana Yatra. Krsna and Balarama had brought me here to do some service for Them, guess what.. a management meeting. Chandana Yatra coincides with Aksaya Tritiya, which is the day that Satya Yuga began, also Lord Brahma first manifested grain on this day, thus providing the means to offer sacrifice and the sustenance for all living beings. Therefore Aksaya Tritiya is a very favorable day to make a new beginning or commitment. In the morning the atmosphere in Vrndavana was calm and peaceful, I took advantage of this by chanting hare krsna. We remembered Madhavendra Puri, the perfect Prema Bhakta, who was so deeply absorbed in love of God, that he did not bother to make any material arrangements not even to eat. Madhavendra Puri sat at the side of Govardhana at Govinda Kund, absorbed in chanting the Holy Name. Then a cowherd boy came who brought him a pot of milk. The boy was very pleasant and said he would come back later to collect the pot, but he never returned. Later that night Madhavendra Puri had a dream and then he saw the boy again and this time recognized Him as Krsna. Krsna told him that in His Deity form, He had been hidden in the bushes by a pujari who fled in fear of his life, for muslims who destroyed temples and killed people all over Vraja. The Deity of Gopal instructed Madhavendra Puri to exvacate Him along with the villagers and once again resume the worship. After he awoke Madhavendra Puri arranged for all of that, but later Gopal asked him again in a dream for cooling sandelwood paste, since He still felt very hot from lying in those bushes in the hot sand for a long time. Madhavendra Puri although at an advanced age embarked on a journey to Jagannatha Puri to obtain the sandelwood. On the way in Remuna the Deity of Gopinatha stole a pot of sweet rice for Madhavendra Puri and later Gopal appeared again in Madhavendra Puri’s body and told him to put the sandelwood on Gopinatha’s body, which was non different from His own. Thus we are commemorating all these pastimes at the time of Chandana Yatra. 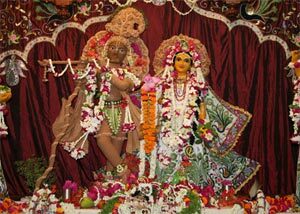 In Vrndavana there is a huge crowd and all the major temples are covering their Deities from head to toe in sandlewood. large numbers of people come from all over to have darsanas of all the Deities in the major temples. The atmosphere is filled with enthusiasm and expectation. There is a competition between the temples who can provide the best chandana darsana. The main competitors are undoubtedly Radha Damodara, Radha Ramana, Radha Syamasundara and the Krsna Balarama temple with its three altars. One must come to Chandana Yatra and join the mad rush to see for himself who is the winner. It is an individual matter, it has everything to do with the relationship of service one has with a particular Deity how that Deity reveals Himself. This year I decided to become swept up in the festival and went on the Hari Nama party with Dina Bandhu and a group of devotees. At Banke Behari temple there was an intense crowd and we were having an ecstatic kirtan going by then, the Vrijbasis got in the mood and various people started to dance along with us. Dina Bandhu explained that on this day only Banke Bihari is showing His lotus feet and that one of the feet of the lord is the lotus foot of Krsna and the second one more slender the lotus foot of Srimati Radharani. Vrndavana! By the time we came to the Radha Damodara temple the crowds had only thickened and people were pushing to get in the narrow entrance gate while at the same time others were pushing with equal force trying to get out. Something that by no means can diminish the ecstacy and satisfaction the people experience upon seeing the Deity. For me the Hari Nam was a great highlight and to offer full obeisances in Srila Prabhupada’s rooms in Radha Damodara for the first time since legal dispute has arisen. I pushed along with the crowd to get some sandlewood from the Deity. There are also other days in Vrndavana, more internal ones, days and nights, to chant peacefully round after round in deep meditation. Or days to read the scriptures for many hours, days of deep bhajana. If I take rest early now then maybe tomorrow can be such a day.